For Blythe Kitner, being a mentor is more than guiding students to success. “A successful student is someone who is more successful than I am. They go above and beyond what I’ve accomplished. 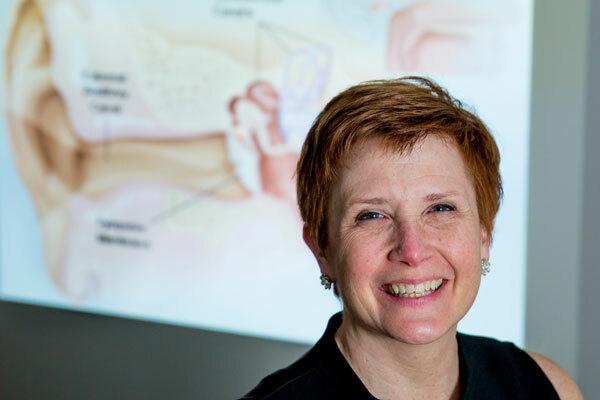 That is my hope for all students,” said Kitner, an audiology instructor and recipient of an NIU Presidential Commission on the Status of Women Outstanding Mentor Award. Under her guidance, students have soared. Students who nominated her for the PCSW award have gone on to head up their own balance clinics. Another student was recently accepted into the Ph.D. program to focus on balance research and training. Her students are successful in part because she challenges them. “When I see potential in students I want them to work to their fullest potential. The more that I see they meet the challenge, the more they believe they are capable of, and continue to flourish.” Kitner said. Kitner’s colleagues also recognize her devotion to her students’ success. “She possesses a level of dedication to our students that is unrivaled in breadth and scope. She is fully invested in seeing students achieve the most of their graduate education,” said Matthew Wilson, an assistant professor in audiology. After a career in genetics and pharmacology research, Kitner developed an interest in balance and vestibular issues when while at graduate school. She transitioned her passion for research into an Doctor of Audiology degree and arrived at NIU in 2012 to head the vestibular clinic as well as teach, conduct research and serve patients. She has been involved in research about the impact of concussion and traumatic brain injury on the vestibular system, and new methods for vestibular assessment and research on the impact of neurological disorders and balance.